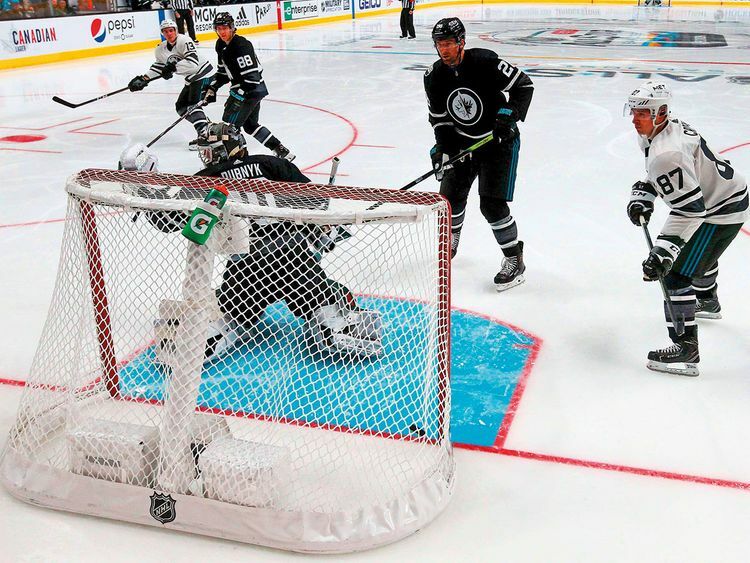 Los Angeles: Sidney Crosby and Mathew Barzal combined for 10 points as the Metropolitan Division defeated the Central Division 10-5 in the championship game of the 2019 NHL All-Star Game. Crosby and Barzal both finished with two goals and three assists and goaltender Henrik Lundqvist stopped all 10 shots he faced in the first half of the two period, three-on-three game at the SAP Center Arena in San Jose, California. Crosby, who was named MVP of the game, assisted on Barzal’s goal against Devan Dubnyk just 22 seconds into the championship contest, and then made it 5-0 in the closing seconds of the first half off a pass from Barzal. Crosby said the 21-year-old Barzal is the one of the best puck handlers and three-one-three players he has seen. “Barzal makes it pretty easy. He lugs the puck so well and skates so well,” Crosby said of his fellow Canadian. The Pittsburgh Penguins center Crosby did not participate in the skills competition on Friday because of an illness. Netminders Lundqvist and Braden Holtby backstopped the Metropolitan Division on its second title in four years of the three-on-three all-star format, and the $1 million (Dh3.67 million0 prize shared by the winners of the four-team divisional tournament.